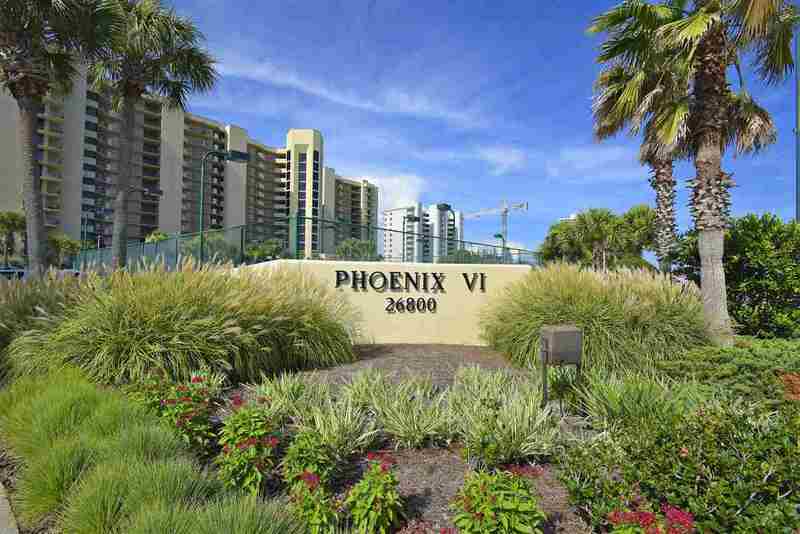 Gorgeous updated 4th floor two bedroom condo in Phoenix VI. Granite countertops, tile backsplash, crown molding, tile throughout, double vanity in master, stacked washer/dryer combo, updated lighting, ceiling fans. Great rental income. Enjoy Breathtaking Views. Floor To Ceiling Glass Windows With Unobstructed Views. This Gated Community Offers First Class Amenities: Indoor Heated Pool/Outdoor Pool, Kiddie Pool, Fitness, Basketball, Racquetball and Lighted Tennis Courts, BBQ Area, Sauna/Hot Tubs, Private Boardwalk For Easy Access To White Sandy Beaches, Outdoor Shower and Full Time On Site Management. Prime Location In Beautiful Orange Beach, AL. Conveniently Located Within Minutes To Restaurants, Shopping, Beaches and More. The Master Bedroom: Master Bedroom has a King Size bed, ceiling fan, reading lamps, floor to ceiling glass doors, a private entrance to the beach front balcony. The private Master Bathroom is equipped with double vanity, tub & shower combo. Guest Bedroom This bedroom features 2 Full Size beds, ceiling fan. Private bathroom features a tub and shower. Updated lighting. Phoenix VI has a beautiful beach-facing pool with waterfalls, an indoor pool and several hot tubs. And yes there is a Kiddie pool that is fenced in for your children's safety. This luxury facility boasts an indoor racquetball court, state of the art fitness center and a sauna. Directions: 1 And 1/2 Miles East Of Hwy 161 And Perdido Beach Blvd Intersection. Gulf Side.